The tar and chip process, also known as Bituminous Seal Coating, is a mainstay of roadway preservation and our capabilities are well known throughout the region. 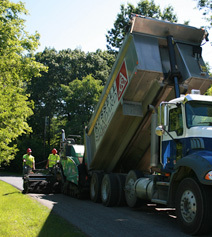 Hammaker East is equipped to handle any project thanks to our computerized distributor trucks and calibrated chippers. Whether it’s doing the complete job or just distributing oil, our products, equipment and operators bring a differentiating level of professional performance to each job.